This small oil-painting was the first of Dadd's canvases to become widely known (Allderidge). It captures a single tense moment amongst the "little folk" on the forest floor. With his back to us in the foreground, down amongst the thin spiked grass, pebbles, daisies, hazelnuts, prickly plane-tree fruits and so on, the Fairy Feller or woodcutter has raised his axe to split an upright nut, apparently to serve as Queen Mab's new chariot (see Lambourne 202, and Romeo and Juliet, I, 3, l. 68) [Continued below] . In front of him is the figure whom Dadd saw as "The Patriarch" ("Richard Dadd"), hand also raised, about to give the signal for the blow. This figure wears an enormous wide-brimmed, triple-tiered hat, along which a number of even tinier figures are ranged — including Queen Mab herself in her present carriage. The curve of the carriage is discernible just above and to the left of the Patriarch's raised hand. Above these tiny figures, in the centre, stand a clearly recognizable couple, Oberon and Titania. Many more diminutive beings inhabit the canvas, from an insect herald (a cross between a dragonfly and a grasshopper, facing out of the picture, upper left) to an apothecary with pestle and mortar (upper right, felt to represent Dadd's chemist father) and the peasant in his smock next to him. Beside the Feller himself, hands on knees and face raised, waiting with particular intensity for the blow to fall, is a fair-haired young man with one sleeve pulled up over the elbow and brown breeches, ready to care for the chariot's horses. Amongst the others nearby is a grim, elf-like old man with a white beard, watching the proceedings with glaring eyes — this figure appears to be judging how accurately the blow will fall. Amusingly, Dadd identified him as a pedagogue (see "The Fairy-Feller's Master-Stroke"). 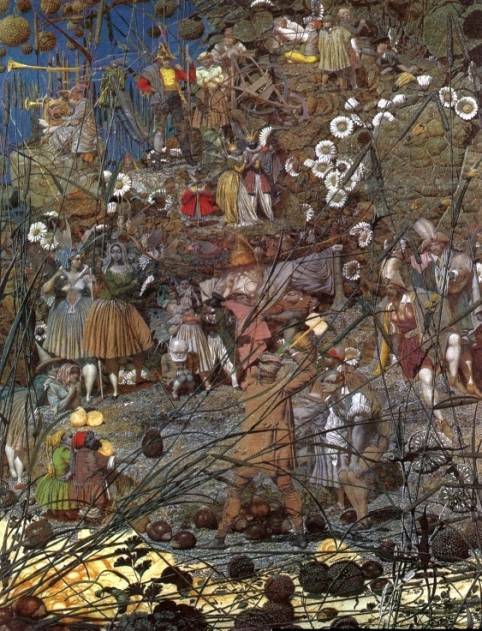 Dadd, who was particularly fond of Shakespeare's fairy descriptions and was a gifted miniaturist, worked on this mysterious and extraordinarily detailed picture for up to nine years while incarcerated in Bethlem (or Bedlam). He left a cryptic poetic commentary on it, entitled "An Elimination of a Picture and Its Subject — called the Feller's Master Stroke." Perhaps the picture can also be seen as a re-enactment of that momentous split second before which Dadd acted on his impulse to attack his father, an event which tragically sealed the fate of both father and son. For a fine discussion on the aesthetic qualities of the painting, such as the speckling of dewdrops on leaves and elsewhere, and the repetition of spherical shapes, see "Private View: Sigmar Polke" (Tate Etc., Issue 1, Summer 2004), available offsite here. Allderidge, Patricia. "Dadd, Richard (1817-1886)." The Oxford Dictionary of National Biography. Online ed. Viewed 27 February 2009. "The Fairy-Feller's Master-Stroke." (This uses substantial excerpts from Dadd's poem about the painting, together with Allderidge's and Greysmith's books on Dadd, as commentary on Freddie Mercury's lyric of the same title, for the rock group Queen.) Viewed 27 February 2009. Lambourne, Lionel. Victorian Painting. London & New York: Phaidon, 1999. "Richard Dadd. The Fairy Feller's Master-Stroke (1855-64)." Viewed 27 February 2009. Greysmith, David. Richard Dadd: The Rock and Castle of Seclusion . Worthing: Littlehampton Book Services, 1973.